Does your company look at content through customers’ eyes? Here’s one way to tell: Look at your marketing content. For starters, riffle through some titles. Do the words typically convey customers’ concerns? Or do they mostly call attention to the things you sell? If products hog the spotlight, you’re missing opportunities to build customer relationships and, ultimately, revenue. You’re also missing opportunities to streamline your content efforts throughout the organization, including distribution, management, and reuse. The content team at Red Hat found this out first hand. A few years ago, the team took a hard look at the company’s content and found that it was heavily oriented toward what Red Hat sells (IaaS solutions, PaaS solutions, Linux solutions, and so on). The team discovered loads of diverse content that was hard to find, disorganized, difficult to reuse, and, most importantly, not customer-centric, says Red Hat’s marketing content curator and librarian Anna McHugh. After the team looked at the content through the customers’ eyes, the path became clear. They created a framework around the audience’s challenges, reorganizing and tagging the content accordingly. They then decided which content to retire, which to refashion, which to create, and which not to create. The results? “Promising,” Anna says. Although it’s impossible to tie the content overhaul directly to the company’s financial performance, she believes that the new focus on customer-oriented content contributed to Red Hat’s highest first-quarter revenue growth in four years. Revenue specific to emerging technology (including app development) ­– an area related to the top customer challenges that Anna’s team helped identify and address­ ­­– grew year over year by 41% in the first quarter and 44% in the second quarter. Drawing from emails with Anna and from her Content Marketing World talk, Beyond Traffic Reports: Using Data, Organizational Messaging, and Passion to Reinvigorate Your Content Strategy, this post sums up how the Red Hat content team did all this and how you can, too. The evaluation was all about getting real-life feedback from potential Red Hat customers rather than relying on the formal personas to decide what to create and distribute. Our research also helped Red Hat refine and deepen its understanding of the personas and flesh them out. Today, the four challenges inform not only the way the content teams plan and organize the content but also the way Red Hat’s sales and marketing teams talk with customers. When people visit the Red Hat website and click “Technology,” they can quickly find content that will help them because they can navigate based on the challenge they’re facing. If you wonder how a company can narrow its customers’ top challenges to four, keep in mind these are high-level challenges. Each contains a range of use cases. 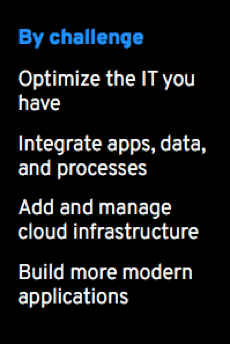 For example, within the challenge “build more modern applications,” the use cases vary. Startups and multinational enterprises, for instance, have separate issues related to building apps. “We create different content for each use case,” Anna says. For your sales and marketing to succeed, demonstrate empathy and understanding of your customer’s problems, and then kick off conversations with them about how you can help. 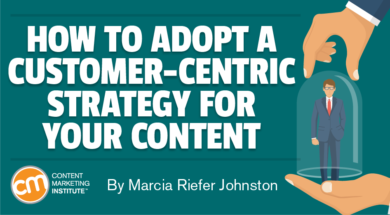 After you determine your customers’ top challenges, align your content framework accordingly. By “content framework,” I mean the way your team thinks about your whole collection of content at the highest level, including the metadata used to categorize and otherwise tag content. It became clear that it was not just the content itself that needed to become more customer-focused but also the mechanisms and structure for creating, sharing, and reusing that content. Anna emphasizes the importance of labeling content such that it helps employees, customers, and prospects find or analyze the content they care about. Whether she uses the term “taxonomy,” “tagging,” or “labeling,” her main takeaway is: Identify topics with metadata that enables everyone to easily discover groupings and relationships between pieces of content. Give your metadata as much attention as your content. Otherwise, your company doesn’t get full value from its content as a business asset. CMI’s recent content management and strategy research confirms that while 92% of respondents say their brands view content as a business asset, few marketers have the processes and tools to make this a reality. Key to those processes and tools is strategic use of metadata, including taxonomy. Sometimes when I talk about taxonomy, people’s eyes glaze over. Sometimes they understand – aha – it’s about how we label all those pieces and how we find the ones we want and link them together. Adding the new tags to all our existing content meant tagging a lot of pages and a lot of collateral. I drank gallons of coffee and knocked out the job in a couple of days. Thanks to Anna’s caffeine-aided dedication to applying metadata to thousands of pieces of content, people can now browse the Red Hat site under the subject of “technology” by clicking around in four categories that reflect the highest level of the taxonomy: product line, topic, industry, and customer challenge. Red Hat has other categories for internal use, but these are the ones it exposes on its website today. Anna’s team took time to roll out the new framework across the company and the investment paid off. Sales and marketing, for example, now know where to find content that addresses customers’ pain points. When the team puts together email campaigns, for example, they know when to reuse what they have and when to create content from scratch. As your content framework takes shape, look for ways to apply it to every type of content decision you make: what content to create, what content to repurpose or update, how to present that content, and so on. The adjusted content framework, with its rigorous approach to tagging, enables the content team to glean new insights through the measurement tools across all platforms. These tools include Adobe Analytics (not all that different from Google) and internal tools used by Red Hat’s salespeople to pitch content and collateral. A shared understanding of the top customer challenges can help “slice and dice your content performance data to get a fuller picture of a prospect’s needs, which helps your sales representatives create a unique relationship with them,” Anna says. For instance, if a customer researches more than one challenge or investigates several related use cases, sales reps get a better idea of that person’s needs. After you identify your customers’ top challenges, you want to know how much content you have that addresses them. You also want to know what content gaps you need to fill. To learn these things, inventory and audit your content. Now that Red Hat’s content team knows what they have and how to find it, they spend a lot of time repurposing and curating content. “When you come up with a new framework like this, it’s tempting to create a bunch of new content related to it,” Anna says. Red Hat didn’t have to do this. The team found it had hundreds of pieces of content that already addressed the challenges. For example, if someone asked the team to create new content on customer challenges related to using containers, they could point to their 55 articles on that topic. Here are three examples of marketing collateral developed by Red Hat to directly support the customers’ challenges. Look closely at these three titles, and you’ll see parallels in the phrasing of the top four customer challenges. “Integrating Modern Infrastructure and Services” addresses the second challenge (integration). “Answer Digital Demand With Cloud Infrastructure” addresses the third challenge (cloud infrastructure). “Optimize IT to Help Your Organization Grow” addresses the first challenge (optimizing what you have). These new pieces of collateral have proven especially helpful to salespeople and to the marketing and events teams, Anna says. Is your company taking steps to make its own pivot? How’s that effort going? Tell us in the comments. Please note: All tools included in our blog posts are suggested by the sources, not the CMI editorial team. No one post can provide all relevant tools in the space. Feel free to include additional tools in the comments (from your company or ones that you have used). Make plans today to learn in person to boost your knowledge about how to implement a customer-centric content framework. Register to attend Intelligent Content Conference March 20-22 in Las Vegas.